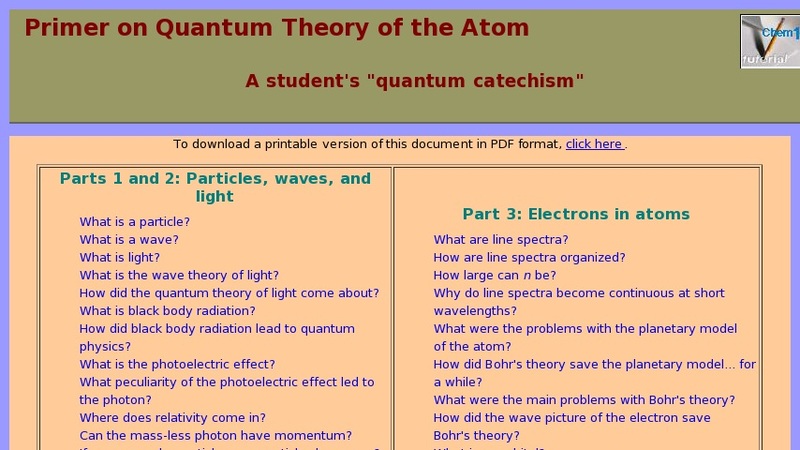 This question-and-answer tutorial provides an introduction to quantum theory and the electron structure of the atom. Suitable for advanced high-school students and those beginning postsecondary education, this "quantum catechism" presents the basic concepts in an easily understood way and with a minimum of mathematical detail. Each question is linked to a relatively brief (several paragraphs long) answer. Topics include particles and waves, the nature of light, black body radiation, the photoelectric effect, the uncertainty principle, line spectra, the planetary model of the atom, Bohr's theory, and other subjects. A printable, PDF version of the document is available.